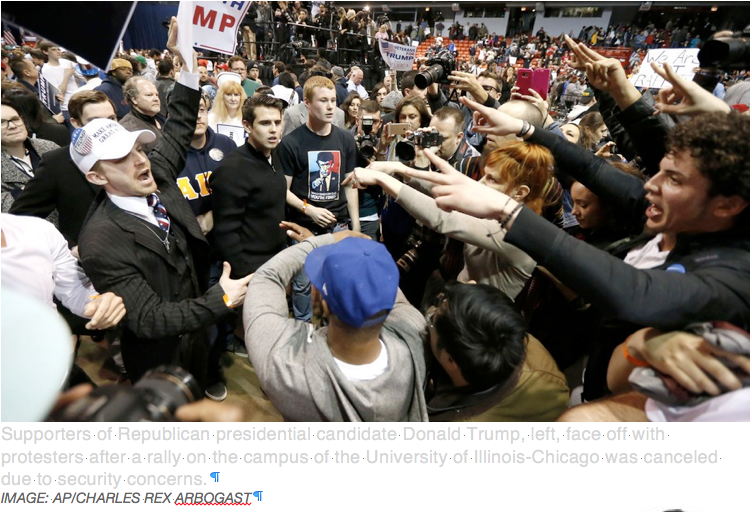 Supporters of Republican presidential candidate Donald Trump, left, face off with protesters after a rally on the campus of the University of Illinois-Chicago was canceled due to security concerns. “You know, part of the problem and part of the reason it takes so long is nobody wants to hurt each other anymore, right?” he explained. His remarks are heard just after the seven-minute mark in the video above. Outside the event, people screamed profanity and anti-Muslim rhetoric at each other while a bloodied protester was given medical treatment. Thirty two people were arrested. 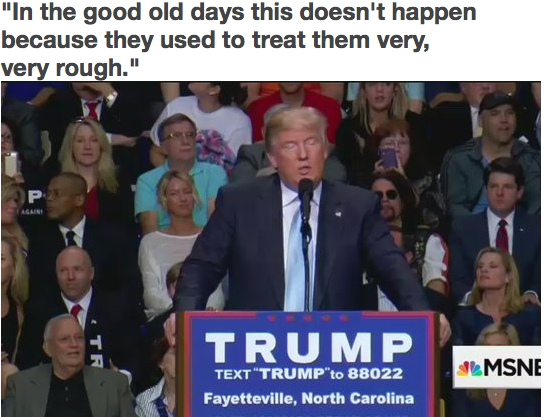 As protesters were being escorted out of the rally in Fayetteville on Wednesday, Trump told the crowd that the protesters were not being treated poorly enough. At a rally in Michigan in early March, Trump again seemed to give the green light to violent behavior. 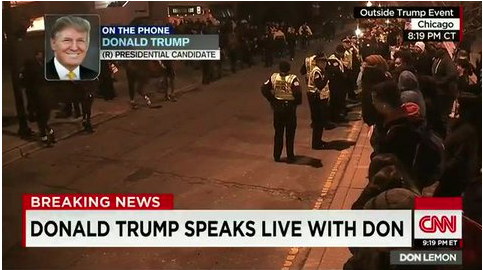 As a protester was being escorted out of the building, Trump marveled at what a “fun time” everyone was having. The crowd is delighted, cheering, clapping and laughing. He then said he’d like to punch the man in the face, again to cheers. After a protester threw a tomato at Trump at a previous event, he encouraged fighting at a later campaign stop in Cedar Rapids, Iowa, in early February. “If you see somebody getting ready to throw a tomato, knock the crap out of them, would you? Seriously.” He again promised to pay for any legal fees associated with an assault. After a Black Lives Matter activist was kicked, punched and, he said, called the N-word at a campaign event in Birmingham, Alabama, in November, Trump expressed his approval. “Maybe he should have been roughed up because it was absolutely disgusting what he was doing,” the now frontrunner for the GOP presidential nomination told Fox & Friends the next day. Trump said the man deserved the treatment because he had been “very obnoxious” and “so loud.” The remarks can be heard just after the 11-minute mark in the video above. Black Lives Matter activists took over a Bernie Sanders campaign event in Seattle in August, asking for a moment of silence for Michael Brown, the teenager who was killed by a policeman in Ferguson, Missouri, in 2014. 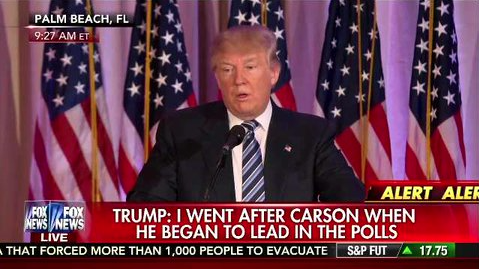 Trump was asked how he would respond to a similar situation. The candidate was defiant, and curious about who would get into a physical altercation when faced with protesters — him or his supporters. That much, now, is clear. This post has been updated with the addition of Trump’s comments at Friday’s St. Louis rally. Next Next post: Its Unthinkable the Mafia Might be Able to Intimidate the Government of the United States!